Beer can chicken is certainly not a new concept. I've done them here and there in the past before, but have just never gotten around to blogging one. I've made this a few times this summer, because it's a nice meal for company that takes relatively little preparation. In fact, I think I'll make another tomorrow, as we still have a couple of frozen whole chickens in the freezer. Though the explanation for this recipe seems extremely long and convoluted, this is actually a meal that requires relatively little preparation. 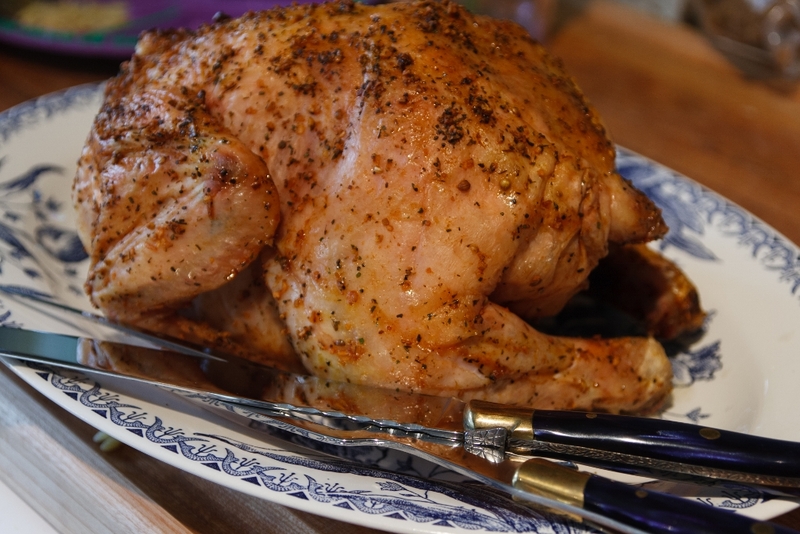 It takes a bit of time to roast the chicken, of course, but it only takes a few minutes to get it ready. And once it's on the grill, you can virtually ignore it. I keep a batch of the required barbecue rub in our cupboard at all times, which makes this really fast to throw together. 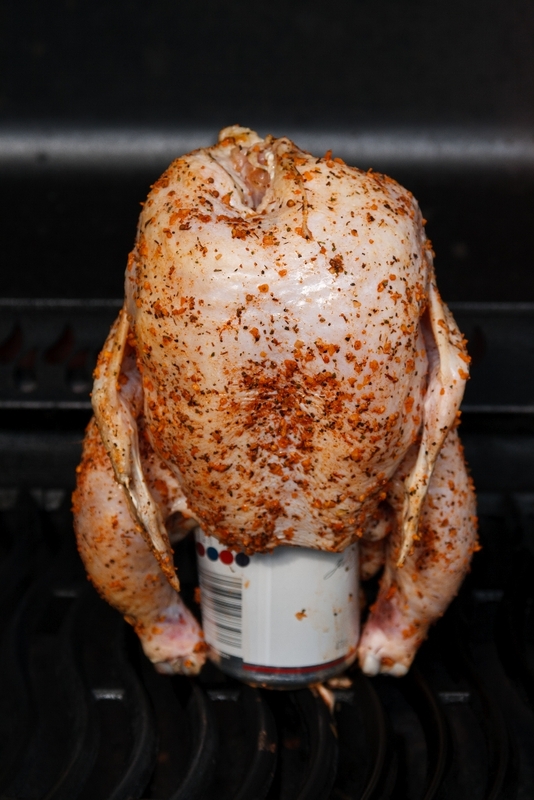 If you don't have time to make the rub, you can use a commercial rub to save time. We don't bother using the wood chips, though I'm sure it'd be even better if we did. Though I traditionally use beer, I used diet 7-Up last time I made this, since we're now gluten-free and beer has gluten. And it worked just as well with 7-Up. 1. Pop the tab off the beer can. Using a church key-style can opener, make a few more holes in the top of the can. Pour our half the beef into the soaking water of the wood chips. Set the can of beer aside. 2. Set up the grill for indirect grilling and preheat to medium. If using a charcoal grill, place a large drip pan in the centre. If using a gas grill, place all the wood chips or chunks in the smoker box or in a smoker pouch and preheat on high until you see smoke, then reduce heat to medium. 3. Remove the packet of giblets from the body cavity of the chicken and set aside for another use. Remove and discard the fat just inside the body and neck cavities. Rinse the chicken, inside and out, under cold running water and then drain and blot dry, inside and out, with paper towels. 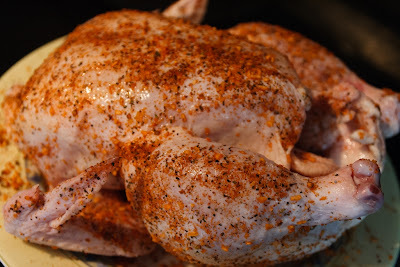 Sprinkle 2 teaspoons of the rub inside the body and neck cavities of the chicken. Rub the bird all over on the outside with 2 teaspoons of the rub. If you have the patience, you can put some of the rub under the skin. 4. Spoon the remaining 2 teaspoons of rub through the holes into the beer in the can. Don't worry if it foams up: This is normal. 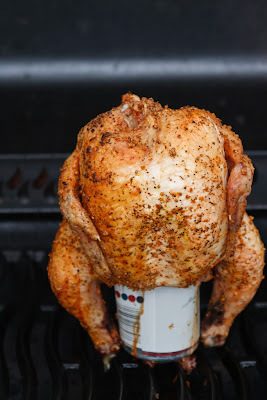 Insert the beer can into the body cavity of the chicken and spread out the legs to form a sort of tripod, as shown in Steps 4 and 5 on the facing page. Tuck the wing tips behind the chicken's back. 5. When ready to cook, if using a charcoal grill, toss all the wood chips on the coals. 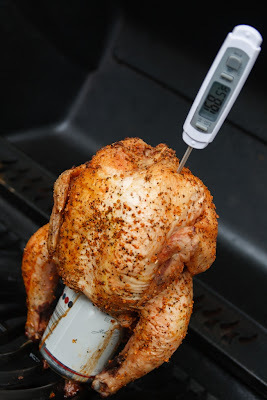 Stand the chicken up in the centre of the hot grate, over the drip pan and away from the heat. Cover the grill and cook the chicken until the skin is a dark golden brown and very crispy and the meat is cooked through (about 180 degrees Farenheit on an instant-read meat thermometer inserted in the thigh), 1 1/4 to 1 1/2 hours. If using a charcoal grill, you'll need to add 12 fresh coals per side after 1 hour. 6. 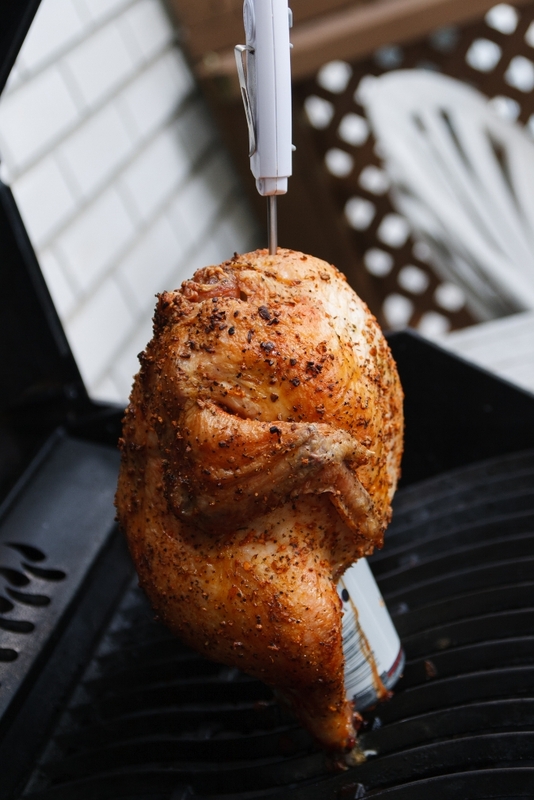 Using tongs, carefully transfer the chicken in its upright position on the beer can to a platter and present it to your guests. Let rest 5 minutes, then carefully remove the chicken from the beef can. Take care not to spill the hot beef or otherwise burn yourself. Quarter or carve the chicken and serve. Taken from How to Grill by Steven Raichlen.